James Davis, attorney for the UDC’s North Carolina Division, told City Attorney Angela Carmon in a letter dated Jan. 25 that there are questions about the ownership of the statue and whether allegations that the statue is a public or private nuisance are legally valid. If the UDC succeeds in delaying Mayor Joines’ plan to move the Confederate statue from Downtown Winston to Salem Cemetary, it’s time for Joines to implement his backup plan. On January 1, Joines made headlines by stating the City’s intention to move the rebel statue at Fourth and Liberty to Salem Cemetary. 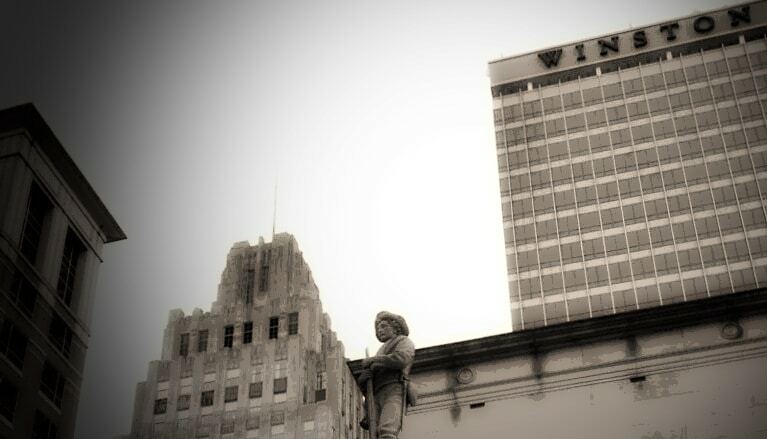 What got less attention was Joines contingency plan to place a plaque in front of or near to that racist statue making it clear that the City of Winston-Salem doesn’t approve of its presence in Downtown Winston. A public shaming of the Confederate statue at Fourth and Liberty would be a great way to say “off to the graveyard” to a public symbol of racism, violence, and white supremacy that has stood in Downtown Winston since 1905. It’s hard to imagine a better way to celebrate Black History month than publicly shaming that racist, rebel statue that for so many years stood largely unchallenged as Joines promoted the downtown properties all around it. As February 1 fast approaches, the mayor must not delay in keeping his promise. He should present the City Council with the plaque that he’s been working on at next Monday’s City Council meeting. Until that racist statue falls (or is relocated away from the city’s center) a plaque must go up to set the record straight! While the City is putting the finishing touches on its anti-racism plaque, perhaps students and faculty at Wake Forest can work on an anti-racism plague for the city’s flagship, white university. Professor Melissa Harris-Perry’s rebuke of WFU’s Jim Crow roots should be the starting point for a plaque by which Wake acknowledges that it is a university born in the Jim Crow era, that directly benefited from the subjugation and exploitation of African Americans (that’s where the vast resources required to move Wake Forest to Winston came from). 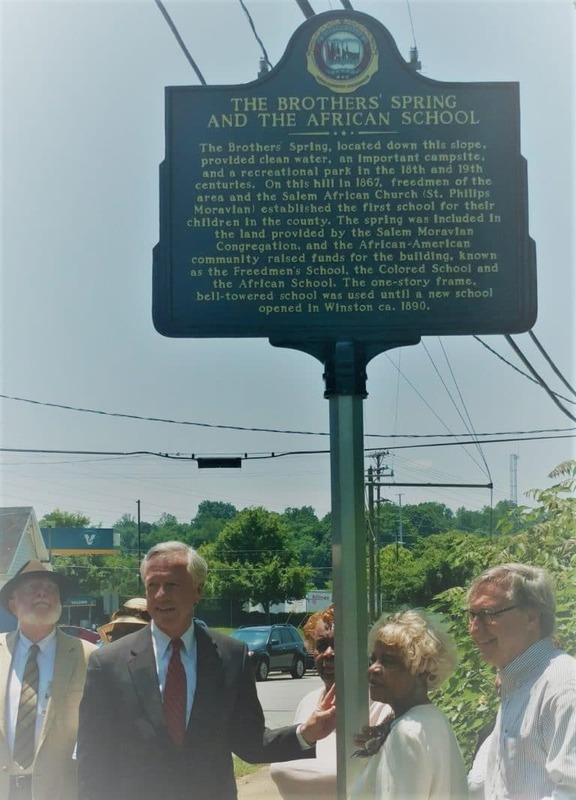 Wake’s Mea culpa plaque could be placed near the historical marker on Silas Creek honoring Five Row, an African American neighborhood just outside of Wake Forest’s gates that was demolished in 1961. Signs of Winston’s Jim Crow past and current separate and unequal state are present throughout Winston; you only have to look for them. But a sign at or near Winston’s Confederate statue knocking Johnny Rebel down a few notches would serve as a needed counternarrative to that racist statue. Hopefully, it would spark a community-wide debate about the systematic racism in Winston, and steps we can take to make Winston-Salem/Forsyth County a better place for all its residents, regardless of race or socio-economic status. 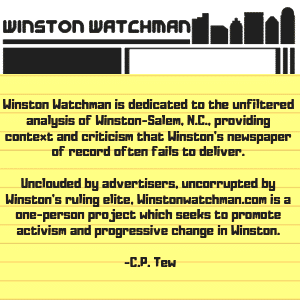 In accordance with our role of studying issues of discrimination and advising the Winston-Salem City Council on how we can best promote a culture of equity and inclusion throughout the City, the Winston-Salem Human Relations Commission (“WSHRC”) expresses our strong support for the position of the Mayor and the City in calling for the immediate removal of the Confederate monument located at 4th Street and Liberty.